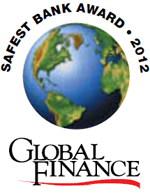 NEW YORK, August 16, 2012 — Global Finance magazine ( GF mag.com) has named the Safest Banks in Asia in an exclusive survey to be published in the October 2012 issue. Winners were selected through an evaluation of long-term credit ratings—from Moody's, Standard & Poor's and Fitch—and total assets of the 500 largest banks worldwide. Singaporean banks banks dominate the list once again this year, taking the top three positions, and Japanese banks also perform well, with five in the top eleven.